The skillful Wilkes-Barre Scranton Penguins arrive in Allentown for the very first time this 2015/16 season ranked as THE # 1 club among all 30 American Hockey League teams with a .773 percentage having taken a total of 34 out of a possible 44 points thus far (seventeen wins, five losses in regulation time, zero losses in overtime / shootout). 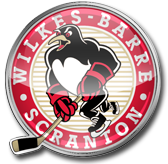 Wilkes-Barre Scranton snapped out of a three-game losing streak which saw the Penguins score just one goal in three consecutive contests last weekend by stomping the Syracuse Crunch 6-2 on Wednesday night in northeastern Pennsylvania. Second-year pro Matt Murray, last season’s AHL Rookie of the Year as well as the winner of the award for the AHL’s Best Goaltender, stopped 30 shots and in doing so boosted his save percentage this season to .935, a figure which is currently fourth best in the entire league. Dominik Simon, the 21-year-old winger who is a legitimate candidate for AHL Rookie of the Year this time around, netted twice and moved into a tie for ninth place on the league scoring chart with 21 points (nine goals). Simon, who had a breakout season with HC Plzen after transferring from HC Sparta Prague and then skated with established NHL stars such as Jaromir Jagr and Jakub Voracek on the Czech Republic squad that finished fourth at the 2015 IIHF World Championships last spring, would have celebrated the hat trick against the Crunch were it not for his third period shot that rang off the crossbar following a two-on-one with Penguins linemate Carter Rowney (21 ga, 7 go, 11 pts, 4 pen, + 11 def), the undrafted third-year pro from the University of North Dakota who is tied with three other WBS players for second-best plus/minus rating on the team … Truth be told, Kram might be tempted to say everything balances out in the end because Simon actually hit the iron for a second time in the third period on a breakaway effort, but the puck rebounded in off of the Syracuse netminder and allowed the Czech rookie to claim his second goal of the game. Conor Sheary (22 ga, 6 go, 22 pts, 4 pen, + 8 def), the little undrafted second-year pro from the University of Massachusetts at Amherst who was the second-leading marksman for Wilkes-Barre Scranton last season with 20 goals (and 45 points) in only 58 AHL games, also got his name on the scoresheet against Syracuse and moved up to seventh place on the league scoring chart in the process. The 23-year winger has now tallied four goals in his last six AHL games and also shows sixteen points from his last dozen appearances. Many in northeastern Pennsylvania are becoming quite vocal about the sincere belief that the Pittsburgh Penguins should give the undersized Sheary (5’9″ 175 lbs) his NHL chance. Tom Kuhnhackl (12 ga, 5 go, 11 pts, 14 pen, + 10 def), the son of the great scoring hero for the national team of West Germany all throughout the 1970s and 80s who is now in his fourth full campaign as a professional here in North America after skating two seasons in the Canadian junior system, had Wilkes-Barre Scranton’s first goal against Syracuse on Wednesday night. The 23-year-old winger, whose father, Erich, was the leading point scorer among all skaters participating in the ice hockey competition at the 1984 Winter Olympic Games in Sarajevo, Yugoslavia, has battled injuries all season long thus far but has been very effective, averaging nearly a point per game, when in the line-up. Kuhnhackl has clearly enjoyed his last two trips to the PPL Center in Allentown, scoring two goals in the Penguins’ 3-0 triumph over the Phantoms on April 8th and then adding another goal and an assist during Wilkes-Barre Scranton’s 5-1 defeat of Lehigh Valley on April 19th; as it was, the hard-working German grabbed five of his twelve goals in the AHL last season while skating against the Lehigh Valley Phantoms. Derrick Pouliot (21 ga, 4 go, 15 pts, 8 pen, + 11), the attacking defenseman who was the 1st round pick (# 8 overall) of the Pittsburgh Penguins at the 2012 NHL Draft, is Wilkes-Barre Scranton’s proverbial quarterback on the blue line and one player to keep an eye on at the PPL Center. Still a highly touted prospect, the 21-year-old rearguard was teammates with Scott Laughton and Taylor Leier on Canada’s selection appearing at the 2014 IIHF World Junior Championships and led all defensemen in the competition by registering four assists. The 207-pound Pouliot’s partner at the back is Steve Oleksy (22 ga, 0 go, 7 pts, 43 pen, + 11 def), the always rather physical 29-year-old NHL veteran out of Lake Superior State who spent almost all of last season with the Hershey Bears. Niclas Andersen, the 27-year-old Swedish rookie from IF Brynas Gavle who had previously had a couple of seasons with Russian club Severstal Cherepovets in the lucrative Kontinental Hockey League, leads the entire WBS Penguins team at present with a + 12 plus/minus rating. Hard to say for sure whom Wilkes-Barre Scranton will start in goal on Friday. Murray (16 ga, 1.96 avg, .935 svpct) has already made two starts against the Lehigh Valley Phantoms this season but was beaten four times on just 26 shots in the opener between the two teams. The Penguins could easily turn to Tristan Jarry (7 ga, 1.96 avg, .926 svpct), the unheralded 20-year-old who was the 2nd round pick (# 44 overall) of the Pittsburgh Penguins at the 2013 NHL Draft and has begun his professional career by posting an admirable record of six wins against just one loss in his first seven AHL starts. If one watches the second goal from the highly skilled rookie from the Czech Republic on the breakaway in slow motion, one can see Simon’s shot rattle off the post before ricocheting off of the backside of the Syracuse goaltender, who is clearly looks back into his cage just after the Wilkes-Barre winger whips the puck past him.